We’ve all been there. It’s cold, wet, windy – or all three. You’re curled up in your sleeping bag, inside your tent, and it feels like you are still out in the elements. I can say from experience (way too many times), that it’s no fun. Luckily on my most recent trip to the Rocky Mountains, I had the opportunity to pack along a new sleeping bag thanks to Mountain Warehouse. Sliding into the Mountain Warehouse’s Summit 300 Sleeping Bag for my first night under the stars at 8,000 feet elevation, I instantly noticed the nice snug feeling and cushioned surface. The mummy shape hugged my body yet still offered room to move and roll over, and the soft polyester lining was smooth against my pjs. But most importantly, the bag with its Hollowfibre Insulation kept me warm! I was finally able to ditch my fleece base layers, down jacket, and second (and sometime third) extra blanket. Bye-bye cold toes, hello good night sleep. Rated for comfort at 25 degrees (but can be used down to 0 degrees for for those extra cold nights) , the bag reflections your body heat to keep the interior nice and warm. A few other fun features of this Summit 300 includes an interior pocket to keep your electronics near and frost free and two-way zip closures. Plus the bag can compress down to 9 inches by 16 inches and only weights 3.7 lbs for light travel in the back country. Without sacrificing weight for warmth, this bag is an overall great 3-season sleeping bag. 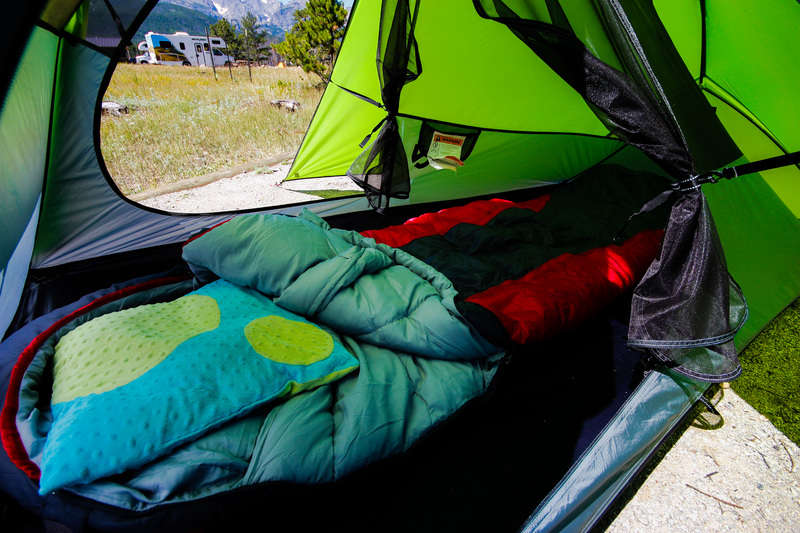 Paired with the sleeping bag, Mountain Warehouse’s Camper Self Inflating Mat gave me that extra lift off the hard ground and further cushioned my night under the stars in Rocky Mountain National Park. Mountain Warehouse is an UK based outdoor retailer featuring a wide variety of camping, hiking, skiing, and travel clothing and gear. Unlike many outdoor retailers, they don’t carry lots of different brands – almost all the products they sell through their stores and website are exclusive to Mountain Warehouse. By cutting out the middleman they are able to offer quality gear at lower cost. Check them out online. Disclosure of Material Connection: I received the Summit 300 Sleeping Bag for free from Mountain Warehouse in consideration for review publication. All opinions are my own. Hi what would you recommend as a less bulky option for hiking? I really love the Marmot Helium (my boyfriend has one and I steal it any chance I get!). It can compress down tightly to about 8 inches by 12 inches and only weighs about 2-3 pounds. Plus its super warm with a 15 degree rating.